For reliable, efficient and fast mowing on any type of grass and ground condition the Peruzzo TRIFLEX offers the ideal solution. The cutting height of each deck is controlled by a full width rear roller and a single front castor wheel. The innovative floating decks helps the mower to cut grass on uneven grounds without damaging the turf. A perfect cut and uniform grass discharge on all mower widths in safety. Hydraulic rams allow the heads to be lifted from the ground and folded into a transport width of 2.25 metres for safe road transport. 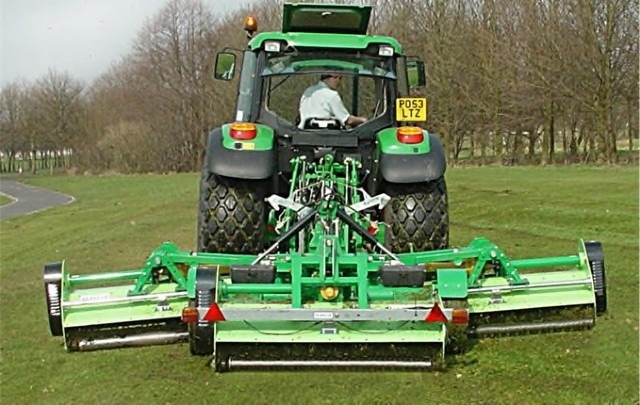 The TRIFLEX gang flail mower is composed of 3 ELK mowers used for grass cutting and small pruning reduction of 1-3 cm. Engineered for its use on wide areas for sports, runways, public authorities, agriculture fields etc. Excellent cut quality performance even on very hilly ground without scalping. SWEEPERS Front sweeper kit to fit on mower for lifting the short grass tread from the tractor wheels.